An avid student & teacher of A Course In Miracles since the 1970’s, Joe began his studies in the Course with the help of his mentor & friend, Julian Silverman, PhD. Doctor Silverman acted as a consultant for National Investment Services, a company Joe presided over, during a time of turmoil. Ultimately, these conversations lead to a peaceful resolution, which Joe now teaches in this book. Loaded with insights and practical ways to apply Course teachings, this book will enrich spiritual seekers everywhere. If you are “Changing Directions…” here is a roadmap to a happier life. You’ll discover a unique diet within these pages & be introduced to concepts appearing outside the norm of worldly conversations. If this resonates with you, something deeply familiar is waking up in you. We’re here to share in your awakening. Joe and Kesha formed a partnership in 1997 and married in 2002. They share a deep love for spirituality, serving as teachers in breath-work, A Course in Miracles and relationship coaching. They travel widely and continue to nurture their relationship from the soul’s perspective. If you’re ready for a happier life, desire peace and wonder how that’s possible, pick up a copy & contact us today. ACIM STUDY GROUP HAS ENDED. No new study groups planned. We’re spending more time in Sedona, AZ and hope you reach out to us if you ever visit the area. There’s many Course groups & related teachings in Sedona- maybe we’ll see you! 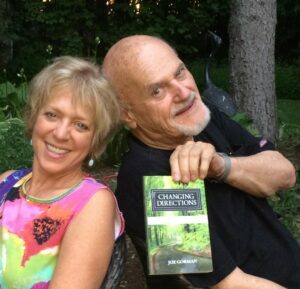 “Changing Directions~Setting A Course To A Happier Life” is this Joe’s only book.